Loading Granite aboard Schooner "Annie & Reuben"
Schooners like the Annie & Reuben carried most of the granite quarried on the Maine coast during the nineteenth century. 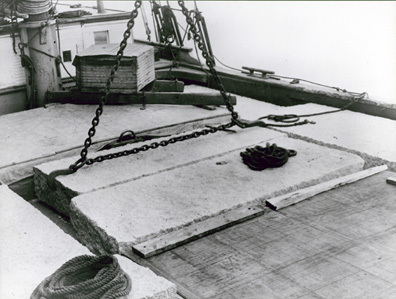 Though not as dangerous a cargo as lime, granite was so heavy that its weight could wear down a vessel, shortening its life and opening its seams. Annie & Reuben was built in 1891 in the backyard of lumberman Reuben S. Hunt's house in Bath and named for his two children. She was bought by John I. Goss & Co. of Deer Isle for their Crotch Island quarry, to carry stone primarily to Boston. While she was in the stone trade her main mast was moved aft to allow more room for the load. Without decreasing the size of the mainsail, a larger foresail was made, and she proved very fast. She sailed until sold for the Cuban sugar trade and went ashore on a New Jersey beach while sailing south in 1943.